Striker Jake Jervis bagged a hat-trick as a Luton Town XI thumped Brentford B 4-0 in a behind closed doors friendly at the Brache this afternoon. 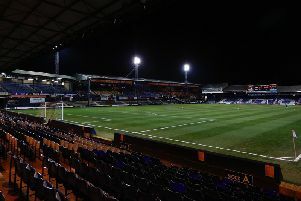 Luton named a side full of first team experience for the game, as alongside Jervis, Sonny Bradley, James Shea, Andrew Shinnie and Luke Gambin all got 90 minutes, while in-demand full back Jack Stacey had an hour too. The visitors had the first chance seven minutes in as Kolbeinn Finnsson’s effort from 12-yards was well blocked by Lloyd Jones, who also repelled Marcus Forss’ strike, James Shea also making a good save from the striker. Luton then took the lead on 17 minutes, when Gambin’s pass split the defence, Jervis slotting into the bottom corner. Just four minutes later, Jervis had his second as after being tripped in the area, he stepped up to net the resulting penalty. Aaron Jarvis came close to a third, as did Glen Rea, with Jack Senior’s 25 yarder palmed away by the visiting keeper. Jervis did have his treble with 20 minutes to go, as cynically brought down when one-on-one, he stepped up to convert a second spotkick of the afternoon. Jones couldn’t quite direct his header beyond the Bees stopper, although Aaron Jarvis made it 4-0 late on, reacting quickest to Bradley’s flick across goals. Hatters: James Shea, Jack Stacey (Frankie Musonda 59), Lloyd Jones, Sonny Bradley, Jack Senior, Glen Rea, Arthur Read, Luke Gambin, Andrew Shinnie, Jake Jervis, Aaron Jarvis.